Red flying squid from the northern Aomori prefecture in Japan, cut with the special “kanoko-giri” technique. When grilled, the cuts will appear unique. Kanoko-giri is the name for the knife-work when an ingredient is cut to have fine grid-like slits on the surface. Another similar style of knife-work that is popular in Japan is the Matsukasa-giri, although this cut requires the knife to be held at an angle. With either method, the cuts open up and look very pretty, while easily absorbing flavors. 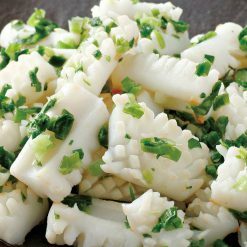 The kanoko-giri cuts in the squid instantly make the dish more unique and appetizing looking, when cooked and heated. The squid will have a very soft and chewy texture. When flavoring, marinating or adding extra spices, the cuts and grooves in the squid will make it easier for the squid to have a long-lasting taste. The squid is ideal for stir-fry or boiling. 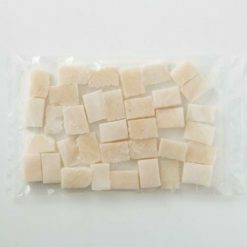 This product comes in easy-to-prepare pre-cut portions of about 2 cm x 3 cm; you can enjoy the squid in bite-sized pieces. The squid comes frozen in the bag, so you may only need to take out the appropriate portions for your needs at a time. Thaw the squid product by soaking in salty water. Remove one frozen squid at a time from the bag. Thaw the squid in salty water at 1.5% (this is one tablespoon of salt per liter of water), by submerging the squid and letting it soak the water. After thawing the squid, please remove all excess water, and feel free to then stir-fry or boil the squid. When boiling squid, boil for 2 minutes over high heat. This should be plenty of time, or else another 30 minutes to an hour will be required to re-tenderize the squid. Stir-frying the squid should require even less time, between 30-45 seconds. This product contains red flying squid (neon flying squid/ Aomori prefecture). This product is not suitable for anyone with allergies to squid. Origin of ingredients: red flying squid (Aomori prefecture, Japan). Prepared and packaged in Japan.